At any given moment, there are roughly 2,000 thunderstorms in progress. There are about 100,000 thunderstorms each year in the U.S. alone. Only about 10% of these will reach severe levels but each storm near you puts your home at risk of water damage. 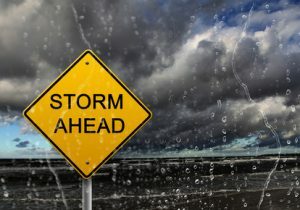 Thunderstorms are most likely during the afternoon and evening hours in the spring and summer months and, but they can occur year-round and at all hours. Under the right conditions, rainfall from thunderstorms can cause hail or flash flooding. Strong (up to more than 120 mph) straight-line winds associated with thunderstorms knock down trees, power lines, and mobile homes. Tornadoes (with winds up to about 300 mph) can destroy all but the best-built man-made structures. Usually, rain is slowly absorbed by the earth and later flows into streams, lakes or rivers. While your home and yard can handle predictable rains, thunderstorms can dump up to 10 times more water than a normal shower. The excess stormwater runoff might be too much to be absorbed by soil and might get into the basement or even the doors, into your home. be blown over before permanent bracing has been fixed. After making sure your family and pets are safe, you must examine your home thoroughly for damage inside and out. Stay clear of fallen power lines. Keep your distance, and don’t retrieve objects near any downed power lines. Search for signs of damage, such as loose or torn shingles, as well as new water stains on your ceiling or leaks in your attic. In Tremonton, when you contact Sierra Restoration for your water and storm damage cleanup needs, you get a highly-experienced team that specializes in high-quality water removal and cleanup services. Choose a company that is fully licensed to handle all your reconstruction work. When your property is damaged it is at risk of water damage and mold growth, so it is important to mitigate the damage as soon as possible. Take immediate action to secure your home and prevent additional damage. Sierra Restoration can provide temporary tarping until permanent repairs can be made. When choosing a company that is fully licensed to handle all reconstruction work after a water disaster, call Sierra Restoration. Since 2010, they have provided their neighbors in Tremonton with quality property restoration and reconstruction services. Sierra Restoration restores dreams– one home at a time with value, quality, and timeliness. Call today at (435) 563-4007.